AKRON, O.H. 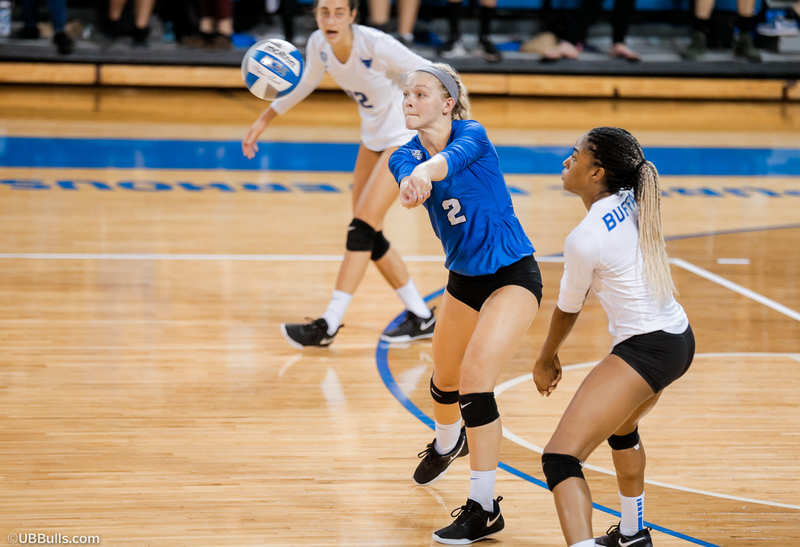 -- The University at Buffalo volleyball team had their two-match road winning streak snapped on Thursday night with a 3-0 loss at Akron. The Zips took the contest 25-13, 28-26, 25-23 as Akron hit .302, opposed to .180 for UB. After a tough first set for Buffalo, UB looked to have life in the second. The Bulls trailed 17-13 in the second when they scored four straight points, including three straight aces from senior Larra Bickelhaupt. The Bulls were able to fight off two set points and then had one of their own as UB led 26-25, but the Bulls couldn't put it away as Akron scored the final three points to clinch the set. Buffalo trailed 16-11 in the third when the Bulls scored six straight points to take the lead. The two teams were tied at 20-20 when Akron scored three straight points on their way to clinch the match at 25-23. Junior Polina Prokudina led the Bulls with nine kills, while sophomore Andrea Mitrovic added eight and senior Megan Wernette had six. Junior Scout McLerran had 28 assists and two aces. Bickelhaupt led UB with 19 digs to go along with her three aces. Mitrovic had nine digs, while Hannah Watson and Paige Beck each had seven. The Bulls finished with 6.0 total blocks. UB will return home on Saturday evening when the Bulls host Ball State at 6pm. The match will air on ESPN3.